Last year was a bad one for motorcyclists, with a new estimate showing that 5,010 bikers were killed in crashes nationwide, the worst death toll in seven years. 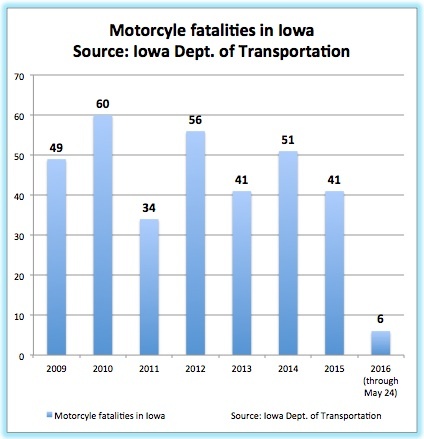 The apparent 10 percent increase in motorcycle fatalities, based on an analysis by the Governors Highway Safety Association, coincided with a projected rise of about 8 percent in traffic deaths overall in 2015. Preliminary figures from the National Safety Council put the traffic deaths total at 38,300, also the highest level since 2008. The rise in biker fatalities, as FairWarning has reported, follows years of advocacy by motorcycle rider groups to prevent regulators from promoting or enforcing tough requirements for safe helmets, the most effective way known to save bikers’ lives. Iowa is one of three U.S. states with no motorcycle helmet law. It had one in the 1970s but the Legislature repealed it in 1976. Analysts say lower gas prices and a stronger economy, by encouraging more driving, are a big part of the explanation for the higher death tolls. But the refusal by many motorcycle riders to wear safe helmets, along with higher numbers of motorcycles on the road, also played a role. Per mile driven, the fatality rate for motorcycles is 26 times higher than that for cars and trucks, according to the National Highway Traffic Safety Administration. At the same time, the federal agency estimates that motorcycle helmets cut the risk of dying in a crash by 37 percent. NHTSA has estimated that, in 2013 alone, 1,630 lives were saved by motorcycle helmets and more than 700 fatalities would have been prevented if all motorcyclists had worn helmets. In the late 1970s, 47 states mandated helmets for all riders. But lobbying efforts by rider groups and “personal freedom” advocates overcame efforts by safety advocates to maintain that status quo. By 2012, after Michigan revoked its longstanding requirement for all riders to wear helmets, only 19 states still had such laws. In Michigan, the law was eased to allow people 21 and older to ride without helmets if they purchased at least $20,000 in medical insurance. The Governors Highway Safety Association report determined that the biggest jump in motorcycle fatalities last year came in Florida, where the death toll was estimated at 550, up from 450 in 2014. The association said Florida repealed its universal helmet law in 2000, making helmets voluntary for motorcyclists 21 and older with at least $10,000 in medical coverage for motorcycle-related injuries. The American Motorcyclist Association — whose business members include Harley-Davidson and the American divisions of BMW, Honda, Kawasaki, Suzuki and Yamaha — says it encourages the use of properly fitted helmets. But the lobbying group “believes that adults should have the right to voluntarily decide when to wear a helmet,” said the AMA’s vice president for government relations, Wayne Allard, in a prepared statement. Three other groups representing riders — the Motorcycle Riders Foundation, the Motorcycle Industry Council and the Motorcycle Safety Foundation – did not respond to requests for comment. The governors’ association said 2015 is expected to be the third-worst on record for motorcyclist deaths. Only twice before has the annual toll exceeded 5,000. In 2008, there were 5,312 motorcyclist deaths across the nation, and in 2007 the total was 5,174. An additional factor behind many of the motorcycle deaths, the governors association said, was drug and alcohol use. In addition, as FairWarning has reported (here and here), consumers have bought tens of thousands of cheap so-called novelty helmets that don’t comply with federal safety standards. To curb motorcycle-related deaths, the governors’ association suggests that riders wear helmets meeting federal standards along with bright clothing so that they can be easily seen by other motorists. It also recommends that motorcyclists avoid drinking or taking drugs and consider getting vehicles equipped with antilock brakes. Researchers said antilock brakes bolster a motorcycle’s stability. 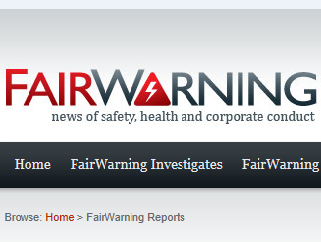 FairWarning, at www.fairwarning.org, is a nonprofit news organization based in Pasadena, California, that focuses on public health, safety and environmental issues.